With seats basically on the sand, this Gold Coast eatery and bar serves up seafood and cocktails to help you make the most of that beachside view. Sun, surf, sand, plus somewhere to sip drinks and snack on seafood — that's every beachgoer's dream. 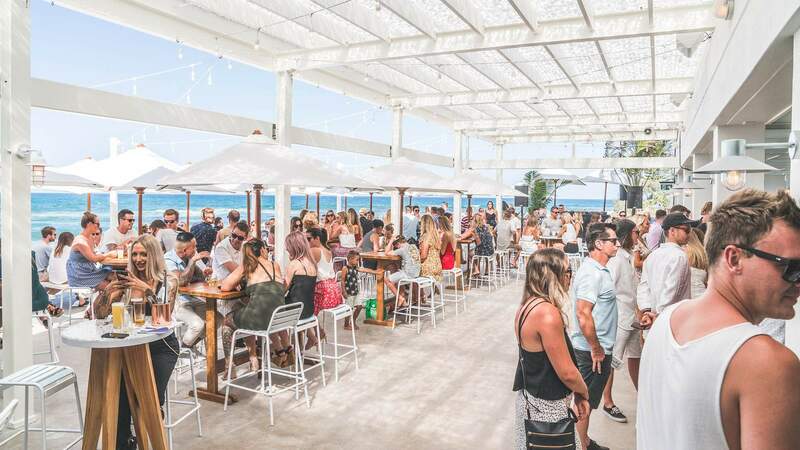 Burleigh Heads on the Gold Coast has long had the warm weather, waves and waterside lounging spots covered, and now it has a new bar and eatery positioned right on the popular strip's beachfront. A 640-person capacity venue as close to the shore as you're going to get, Burleigh Pavilion has taken over level one at 43 Goodwin Terrace. It's a two-in-one kind of place, with a 240-seater restaurant at one end and a huge hangout space at the other — all beneath four-metre-high ceilings held up by timber rafters, and within a space that goes heavy on beachy pastel hues. For those after a sit-down meal, The Tropic is the place to go. As well as water views, diners will look into the open kitchen, where head chef Guillaume Zika oversees the culinary side of things. His menu serves up plenty of seafood — think seafood platters, servings of octopus, and grilled tiger prawns with dry vermouth butter and shellfish oil — while also finding room for sobrassada with pickles, rib eye, plus coconut sorbet for dessert. Food is also available in The Terrace, Burleigh Pavilion's 400-capacity bar. Of course, you'll want a few cold beverages to go with your prawns on ice, freshly shucked oysters, beer-battered fish and chips, and four types of pizza. Drinks-wise, more than 90 wines are on offer, alongside 14 beers on tap — including locals Burleigh Brewing and Balter. Cocktails span a gin and ginger kombucha blend; Bacardi spiced rum with strawberry, lime and vanilla sugar; and another rum tipple with Malibu, pineapple, ginger syrup and lime.